Mary Berry is executive director of the Berry Center in New Castle, Kentucky, a non-profit organization dedicated to promoting what Bill Moyers has called “the agrarian revolution” of her father Wendell Berry, the award-winning writer and farmer. 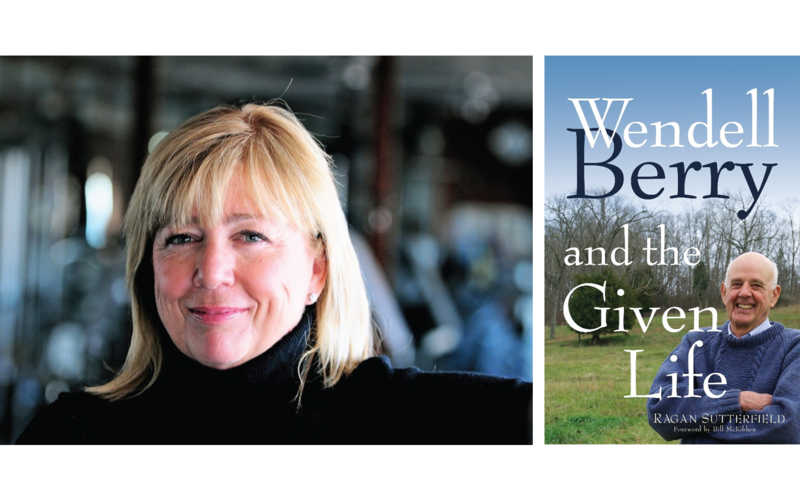 Franciscan Media recently published Wendell Berry and the Given Life by Ragan Sutterfield. On Aug. 2, I interviewed Ms. Berry by telephone about this new book. The following transcript has been edited for style and length. This new book brings your dad’s work to a Catholic audience. What is your opinion of it? It’s a really good introduction to daddy’s work for people who haven’t read him. I always think when I read what people have written about daddy, it’s very good. But I hope it leads people to read daddy’s work itself. The book’s chapters cover twelve themes from your dad’s writings: givenness, humility, love, economics, work, Sabbath, stability, membership, the body and the earth, language, peaceableness and prophesy. Could you boil all of these themes down to one sentence? The importance of daddy’s work, for me anyway, has been to learn to live within the limits I have—to accept the place I have, the work I do, and to be content within it, and not to be always thinking of another place or thing or some distraction, but to always live the life I’ve got. To put it into a sentence: For human beings trying to live sanely and consciously, part of that is learning to accept today, to accept what it offers and be content with the good work it offers. The book concludes with an afterword featuring an interview of your dad. What did you take away from his words? The thing I’m most attracted to in what daddy says is that we’re all complicit—I think Thomas Merton says somewhere we’re all part of the giant sham. I think the thing that’s worrisome to me in my travels and talks, as a left-leaning person, is that people think buying some tomatoes at a farmer’s market is enough. But it doesn’t really mean that much: We’ve got some very basic work to do on how we’re living. To understand how we’re all part of this mess involves making a change in how we live. Although you come from a Baptist family, your father’s spiritual writings have attracted a strong following among Catholics. What explains your dad’s appeal among Catholics and other spiritual seekers? I think daddy speaks the truth. I’ve always thought that when you hear or read someone who’s speaking the truth, it seems different from everything else going on. Why it appeals in particular to Catholics, I don’t know. But he’s talking about true things, and it’s helpful for people who are seeking true things—it’s pretty clear and easy to understand. As executive director of the Berry Center, you’ve pledged to put your father’s writings into practice through what Bill Moyers has called “the agrarian revolution.” What is this revolution and what have been your greatest accomplishments in promoting it thus far? Right now, I don’t think an agrarian revolution is going on. What’s going on is a local food movement that’s not really a local food movement—maybe we have an organic food movement, but it’s bypassing local farmers and workers. We’re starting local beef work, putting an economy around beef production that matches supply and demand and looks at parity pricing. It’s a pretty complicated thing, but the best farming in our area and other places is beef production. With globalization driving more people from rural areas to crowded cities, your father’s writings on agrarian spirituality may strike some American coastal urbanites who have given up on “flyover country” as hopelessly romantic. What’s your response to critics who believe agrarian life is dead and technological progress makes its resurrection impossible? From my perspective, that’s just crazy. We live with limits that are pressing in on us. We’ve got big trouble and technology isn’t going to get us out of it: The people who live in urban places have to eat, so your question goes right back to this agrarian revolution that people seem to think is going on and isn’t. Our loss of topsoil is far outpacing building topsoil—that just can’t keep on and technology isn’t going to fix it. The local food movement is driven by urban people who seem to want healthier food grown closer to them, but it hasn’t happened. So we’re trying to make it happen. Where does globalization fit into the picture? Globalization has made it harder for places like where I live. We can provide some of the things we need, but we have to drive farther and farther to get much of what we need. Globalization has taken away our choices. There’s a technological fundamentalism that’s absolutely crazy. There’s a hubris going on that thinks the human brain is going to get us out of global climate change, erosion and all the social problems arising from the loss of agrarian culture. People can say technology is going to help with it—and technology is a tool that can help—but we’re not asking the right questions that would lead to an agrarian revolution. What are these technologies costing us? What are we giving up? As far as I can tell, we’re just going along with technology without asking any questions, but my father is one of the people asking questions. In a world economy driven by intellectual property and technological advances, the “back to nature” vibe of your father’s writings may feel like a relic of the 1960s to many people competing today. From your perspective, what is agrarian life and why do we need it? Small farmers and people who understand good land use may turn out to be the most essential people in the culture, but it’s hard to find any period in history where they have been valued. They haven’t been valued and we’ve lost them. The practical need is that we’ve got to eat, but people don’t want to do the hard work of farming. A farming life, a food-producing life, leads you to [understand the] proper scale of things: what we as humans can and cannot do. What’s the hardest thing for you about being a farmer? Sometimes it doesn’t rain, and sometimes it rains too much, and sometimes things don’t go as planned. Farmers live always with the weather and you do well or you don’t according to things you can’t control. For me, the hardest thing about being a farmer in my lifetime is that we’ve watched our farming communities slowly and then more quickly fall apart. That’s been painful to watch, painful to live in the middle of, but I don’t want to live anywhere else. The urban pressure and loss of the farm economy have amplified social differences—they have become very troublesome. All of the things that led us to Trump began to happen in my own community—that’s been hard and heartbreaking. The pope has spoken often about the “globalization of indifference” that leaves many parts of the world behind. If you could say one thing to Pope Francis about the future of agrarian society, what would it be? I don’t know what I would say to Pope Francis, but I would say to anyone that the work we have to undertake now is the work right in front of us: We have to work in the places where we are. In rural Kentucky, where I am, we’ve long since given up on the cavalry coming: It’s not going to come. We have to solve our own problems. We have to go to work right outside our churches. That’s not to negate the good work people do for refugees, but the Protestant churches have thought too much about places far away and not enough about our own backyards. What do you want people to take away from your family’s life and work? I think you can give up some things that our culture tells us are necessary. You don’t have to have everything that everybody says you need. You can give up upward mobility—and even mobility at all—and live a fascinating life in a place like Henry County, Kentucky. My family has done it for eight generations. I’m not saying it’s perfect. But I can spend endless days on the farm where my husband and I live and not want to be anywhere else. Sean Salai, S.J., is a special contributor at America.